Aletha Jane Hinshaw1,2,3,4,5 [Aletha S. Hinshaw6,7,8]. Bird, Ellis C., head-of-household, age 30, born Sept 1869 in North Carolina; parents born in North Carolina; married 7 years; occupation: farmer; owned farm (free). 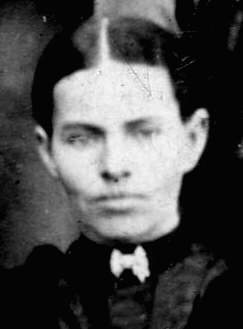 Bird, Aletha J., wife, age 30, born Oct 1869 in North Carolina; parents born in North Carolina; married 7 years; 3 children, 3 living. Bird, Clarence, son, age 8, born June 1894 in North Carolina; parents born in North Carolina. Bird, Floy, daughter, age 4, born Nov 1895 in North Carolina; parents born in North Carolina. Bird, Colon, son, age 2, born Nov 1897 in North Carolina; parents born in North Carolina. Brown, Rufus, servant, age 21, born Aug 1878 in North Carolina; parents born in North Carolina; occupation: servant. Bird, Ellis C., head-of-household, age 40, born in North Carolina; parents born in North Carolina; first marriage, married 16 years; occupation: farmer, general farm; rented farm. Bird, Letha J., wife, age 40, born in North Carolina; parents born in North Carolina; first marriage, married 16 years; 6 children, 6 living. Bird, Clarence H., son, age 15, born in North Carolina; parents born in North Carolina; occupation: farm laborer, home farm; attended school. Bird, Floy A., daughter, age 14, born in North Carolina; parents born in North Carolina; attended school. Bird, Colon O., son, age 12, born in North Carolina; parents born in North Carolina; occupation: farm laborer, home farm; attended school. Bird, Ray E., son, age 9, born in North Carolina; parents born in North Carolina; attended school. 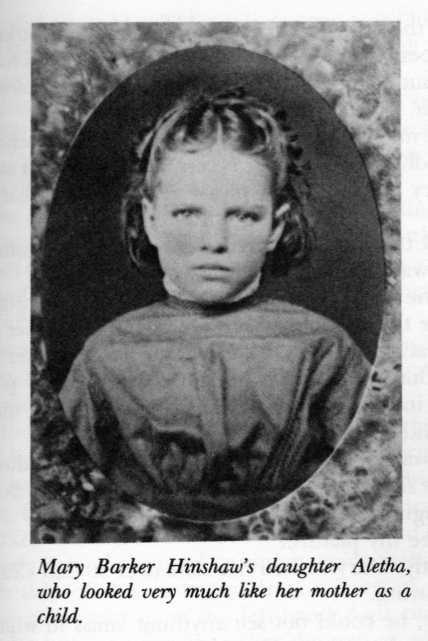 Bird, Nellie R., daughter, age 7, born in North Carolina; parents born in North Carolina. Bird, Francis E., son, age 3, born in North Carolina; parents born in North Carolina. Byrd, Ellis C., head-of-household, age 50, born in North Carolina; parents born in North Carolina; owned home (free); occupation: farmer, general farm. Byrd, Letha J., wife, age 50, born in North Carolina; parents born in North Carolina. Byrd, Floy J. [initial unclear], daughter, age 24, born in North Carolina; parents born in North Carolina; occupation: saleslady, department store. Byrd, Colon O., son, age 22, born in North Carolina; parents born in North Carolina; occupation: salesman, department store. Byrd, Ray E., son, age 19, born in North Carolina; parents born in North Carolina; attended school; occupation: laborer, home farm. Byrd, Mellie M., daughter, age 17, born in North Carolina; parents born in North Carolina; attended school. Byrd, Francis E., son, age 13, born in North Carolina; parents born in North Carolina; attended school. Byrd, Ellis C., head-of-household, age 60, born in North Carolina; parents born in North Carolina; first married at age 23; owned home; no radio in home; occupation: farmer, dairy farm; not a war veteran. 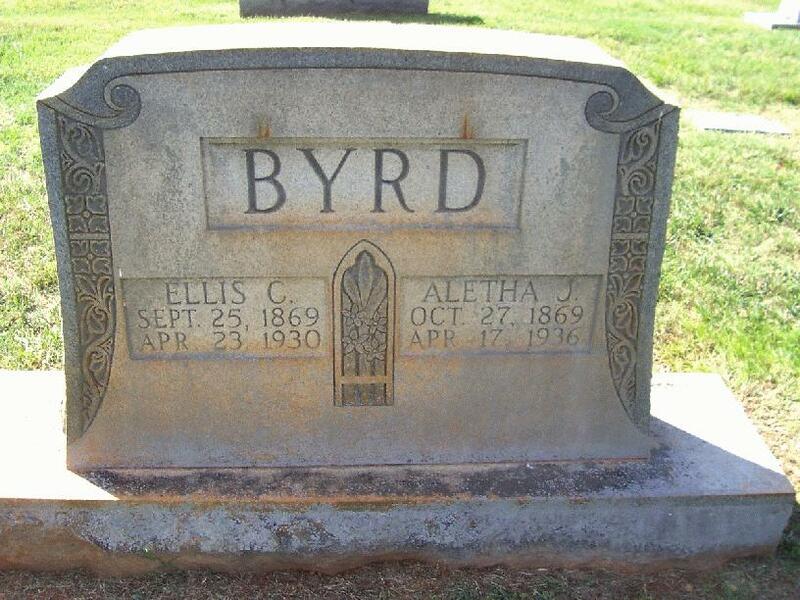 Byrd, Aletha J., wife, age 60, born in North Carolina; parents born in North Carolina; first married at age 23. Byrd, Francis E., son, age 23, born in North Carolina; parents born in North Carolina; single; occupation: farm laborer, dairy farm; not a war veteran..
Byrd, Ray E., head-of-household, age 29, born in North Carolina; parents born in North Carolina; first married at age 23; rented home ($6 rent); no radio in home; occupation: farm laborer, dairy farm; not a war veteran. Byrd, Blanche B., wife, age 27, born in North Carolina; parents born in North Carolina; first married at age 21. Byrd, James R., son, age 4 years 3 months, born in North Carolina; parents born in North Carolina. 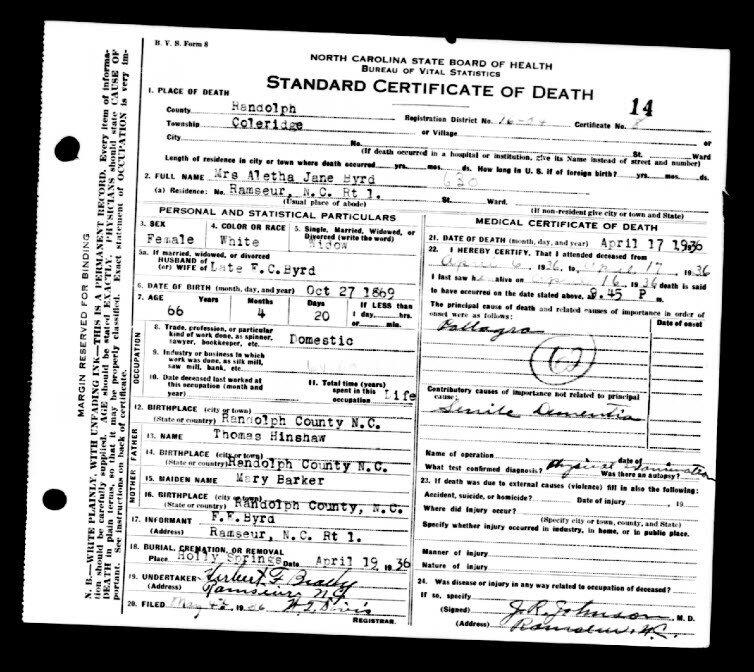 Note that Ellis was shown with his family in the 1930 census on May 14 1930,4 three weeks after his death. 1870 census, Moffitt Mills P.O., Pleasant Grove Twp., Randolph County, North Carolina; page 440, line #25, dwelling #46, family #45. 1900 census, Pleasant Grove Township, Randolph County, North Carolina; roll T623-1213, ED 92, page 5A, line #14, dwelling #88, family #88. 1930 census, Coleridge Township, Randolph County, North Carolina; roll T626-1714, ED 9, page 17B, line #69, dwelling #201, family #263. 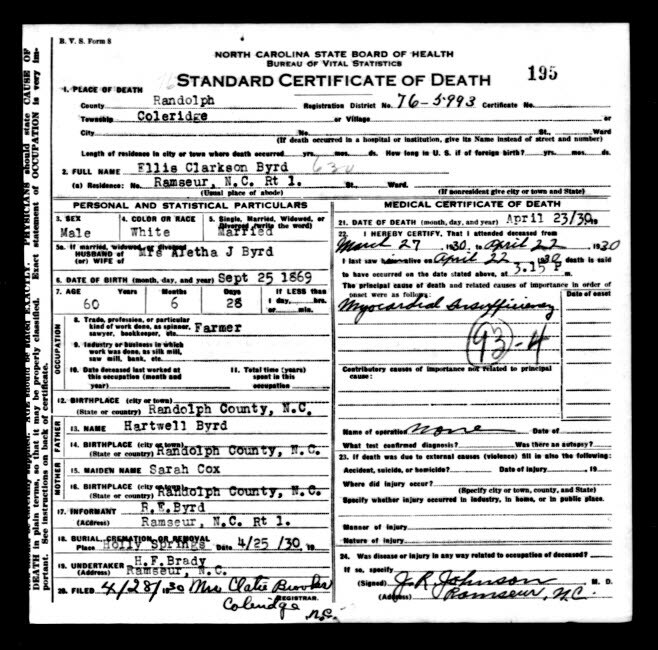 North Carolina Death Collection, 1908-2004; http://www.ancestry.com. Handwritten notes by Cyrus' nephew Seth. 1910 census, Coleridge Township, Randolph County, North Carolina; roll T624-1128, ED 80, page 15A, line #48, dwelling #259, family #260. 1920 census, Coleridge Township, Randolph County, North Carolina; roll T625-1318, ED 100, page 8A, line #43, dwelling #142, family #142. 1920 census, Coleridge Township, Randolph County, North Carolina; roll T625-1318, ED 100, page 10B, line #83, dwelling #184, family #184. 1930 census, Coleridge Township, Randolph County, North Carolina; roll T626-1714, ED 9, page 13B, line #87, dwelling #178, family #188. Contribution from Darian LaRue Byrd (). "Ancestry World Tree" data by "Rechcigl" (). North Carolina Marriage Collection, 1741-2004; http://www.ancestry.com. 1900 census, Pleasant Grove Township, Randolph County, North Carolina; roll T623-1213, ED 92, page 5A, line #20, dwelling #89, family #89. 1900 census, Pleasant Grove Township, Randolph County, North Carolina; roll T623-1213, ED 92, page 5A, line #23, dwelling #90, family #90. 1900 census, Pleasant Grove Township, Randolph County, North Carolina; roll T623-1213, ED 92, page 5A, line #29, dwelling #91, family #91. 1930 census, Coleridge Township, Randolph County, North Carolina; roll T626-1714, ED 9, page 17B, line #72, dwelling #201, family #264. "Mary Barker Hinshaw, Quaker", by Seth Bennett Hinshaw; Whittier College library. Photo courtesy of Waldo Hinshaw.